When Casey and Gianna Reynolds first met for coffee, it was to collaborate for a creative project. Although that particular project didn’t land, a relationship between the two ensued. Fast forward six years, and the married couple have been working together on creative projects ever since. Gianna does the fashion designing, and Casey handles the media. Their latest project, a fashion show, has been the couple's creative baby they’ve been nurturing for the past year with the help of a myriad friends. The upcoming immersive fashion showcase at House of POp this Sunday, April 8, is a multimedia event that includes accessories by Sam Moore of Dope Kawaii, a cinema piece by Antelabel and dance performance by Mackenzie Fagras. Gianna’s latest fashion collection, dubbed Nooskool, is also featured by the models. Attendees can expect freeze modeling and a few other surprises. 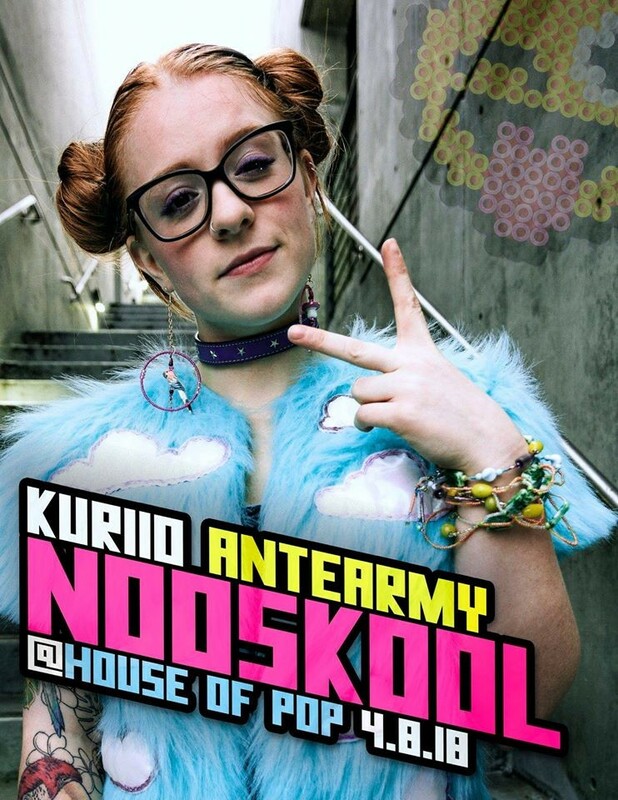 Nooskool is inspired by Gianna’s love of Japanese fashion, the rave scene, cyberpunk and hackers. The collection began with a jacket, and Gianna added pieces later that were centered around that look. With her previously-established fashion company, Kuriio, with the ethos and tagline of “fashion for weird people,” it’s evident that Gianna doesn’t stray from unusual looks or materials. She looks for ways to revive or recycle items, like a rain jacket she made from a shower curtain. Being a self-proclaimed hoarder, she never runs out of things to add or use in her designs. Nothing is duplicated, because she doesn’t make the same piece twice. “Every single piece she creates has some kind of a backstory or some kind of inspiration. A life of its own,” Casey chimes in. For Gianna, fashion is like painting or sculpting. It is a purely creative outlet, but she happens to also enjoy the commerce side of it. Detail, love and care goes into everything she makes. “I feel like something that’s been worn and loved has some sort of energy and care to it and why not take that and move it into something else to continue to be loved?” says Gianna. Nooskool is a combination of harajuku and street style. It embodies a sassy attitude with weird patterns and bold colors. Although it retains hints of '90s pop culture and nostalgia, it manages to encompass a current and modern energy. “It’s not a throwback. It’s not oldschool. It’s Nooskool,” says Casey with a smile.